Day 2 at the American Ambulance Association tradeshow and conference started with another early morning wake up (curse you time change). I was out the front door of the Hilton by 0530 for another run on Las Vegas Boulevard. As I had the day before I ran a round trip from the Hilton the MGM Grand…about 6.5 miles. The presenter reviewed lots of research studies regarding response times for different types of ambulance responses. The upshot was that response times only appear to matter for first responder/BLS response to cardiac arrest with delivery of an AED and chest compressions. Do you agree? Retraining the public about when and what is an appropriate reason to call 911. The public will continue to call 911, as we have trained them to do. What we can change more easily is the resources we send to the call for help. I have to believe, that because of increasing resource constraints, it will be more and more difficult to send two or more paramedics to every 911 request. Most of my day was spent at the CentreLearn booth in the exhibit hall. I always enjoy talking to our customers about how they are using CentreLearn and answering questions about how to better use CentreLearn. I also had some downtime to visit with my friends at Aladtec, makers of EMS Manager and Fire Manager. 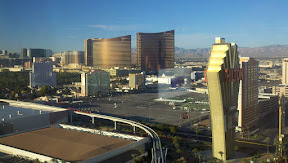 We discussed some interesting ideas for tradeshow giveaways and how to enjoy Las Vegas. I also was alerted that one of my videos about safety and risk management is embedded in the eCore EMS scheduling software demo. The eCore operations manager spent the first day trying to remember where he had seen me before. The second day he realized he had seen me in every product demo he had ever delivered. I am honored for the additional views of those videos. 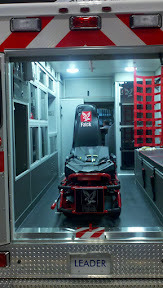 This is a Stryker stretcher in a Flack ambulance. There was some tittering at the conference about a red Stryker cot. Does a Stryker cot need to be yellow? After the tradeshow break down I headed to the Cosmopolitan Hotel and Casino for dinner at the Milos restaurant. We were treated to an amazing meal that started with an egg plant and zucchini appetizer and was followed by two varieties of out of this world grilled Mediterranean fish. The meal was capped with a flourless chocolate cake that simply melted in my mouth with each bite. It was one of the best meals I have had in a long time. I will definitely be going back to Milos. I left Las Vegas on the red eye flight to Detroit for a connection back to Wisconsin. I was surprised to have a great three hour nap … most likely made possible by a single Nyquil gel tablet. Just enough to dry me out, take the edge of a lingering ear ache, and help me sleep.